Today is the Feast Day of the Great Bishop and Saint Polycarp on February 23. When we converted to the Catholic Church my son Jesse chose St. Polycarp as his patron saint because of his great heroism. We filmed the whole life of St. Polycarp on location. I feel like I know him. The name Polycarp sounds funny to our English ears, but in Greek it comes from two words “poly” meaning many or much, and “carp” meaning fruit. Obviously his Christian parents named him Polycarp along with a prayer that he would bear much fruit for the Kingdom of God — which he did. 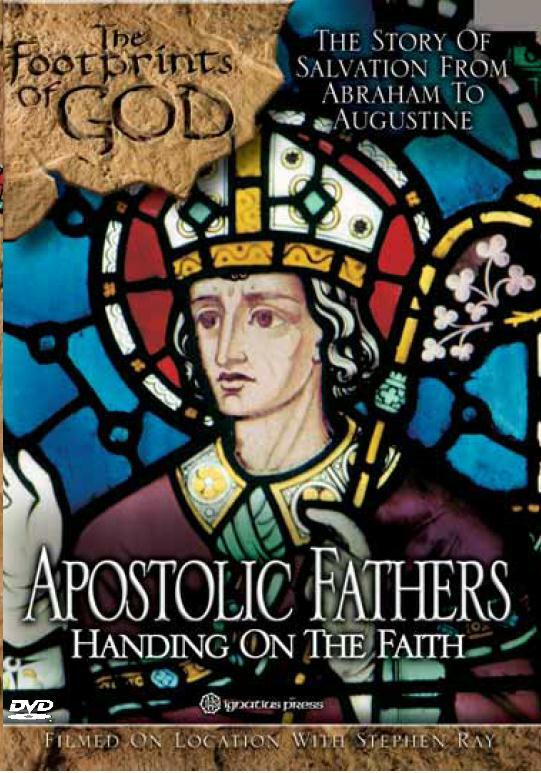 To learn the whole story of St. Polycarp, on location, watch our new DVD “Apostolic Fathers: Handing on the Faith” along with a 28-page Study Guide. This amazing Timeline drives home the point of how close these men were to Jesus and the Apostles. It demonstrates how Catholic the first Christians really were! The Apostolic Fathers faced Emperors, heretics and lions but these heroes of the Catholic faith never lost courage. Chains, prisons and blood-soaked arenas did not stop the early Christians from witnessing for Christ and handing on the Apostolic Tradition. Link to Eyewitness Account of his martyrdom. Link to Letter he wrote to Philippians. Link to letter St. Ignatius wrote to Polycarp. “When I was a boy . . . I remember the events of that time more clearly than those of recent years. For what boys learn, growing with their mind, becomes joined with it; so that I am able to describe the very place in which the blessed Polycarp sat as he discoursed, and his goings out and his comings in, and the manner of his life, and his physical appearance, and his discourses to the people, and the accounts which he gave of his [interaction] with John and with the others who had seen the Lord. And as he remembered their words, and what he heard from them concerning the Lord, and concerning his miracles and his teaching, having received them from eyewitnesses of the ‘Word of life,’ Polycarp related all things in harmony with the Scriptures. These things being told me by the mercy of God, I listened to them attentively, noting them down, not on paper, but in my heart. And continually, through God’s grace, I recall them faithfully (Irenaeus quoted in Eusebius, History of the Church 5, 20 in NPNF 2nd, 1:238-139). Without the PARADOSEIS the Sacred Apostolic Traditions of the Church, we would fall into great error. Happy Authority of the Church Day. Polycarp was the Man of Many Carps. If you want the lowdown on Polycarp, read my column at my blog page. I forget the date, but it was in June–quite recently. Hi Mary, AJ, Valerie, Rick and Lisa!! I hope you’re enjoying your pilgrimage and learning even more about your faith. There is of course so much history there that I can’t even imagine trying to squeeze all of it into a little over a week! It looks in the videos as if you are enjoying yourselves, although it didn’t look as if Dad’s prayers that Mom wouldn’t do any shopping were answered! Enjoy the rest of your trip and I can’t wait to see you when you get home! P.S. Mary and AJ was much easier to distinguish who you are as opposed to calling you Mom and Dad. Be honest, how many “Mom’s and Dad’s” are on this trip?! ?